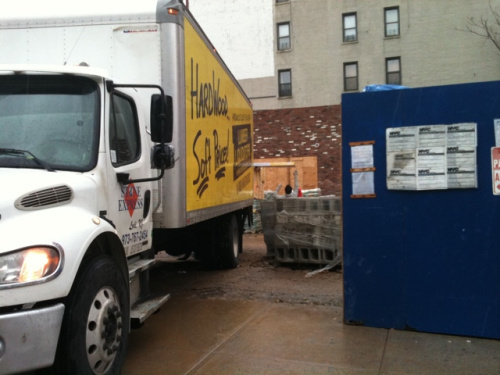 UPDATE: Harlem Tavern receives a big delivery, no April Fools | HarlemGal Inc. While Bad Horse Pizza opens this evening (April 1), looks like Harlem Tavern is slowly moving forward with building the place. 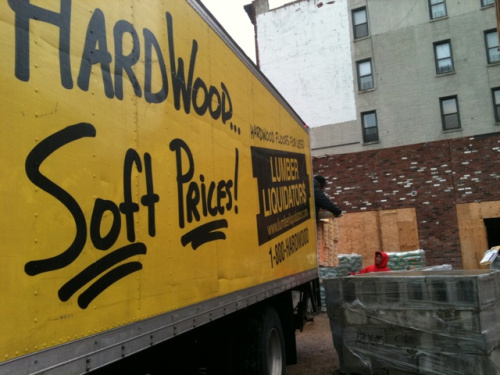 This morning there was a large truck spotted at 301 West 116th Street delivering what I assume is hardwood floors. Plus renderings posted on Harlem Tavern’s website show hardwood floors around the indoor bar and dining section! Given it is April 1st, it’s no joke that Harlem Tavern wants to experience soon what Bad Horse Pizza will experience today, opening day! This entry was posted in business, Community, Events, Harlem, New York, New York City, NYC, real estate, restaurant row, restaurants and tagged 10026, 301 West 116th Street, Bad Horse Pizza, Frederick Douglass Boulevard, Harlem, Harlem Tavern, new restaurant, restaurant row. Bookmark the permalink.